What Is The NIH Stroke Scale (NIHSS)? The NIH Stroke Scale (NIHSS) is a common diagnostic method for quickly assessing the severity of a stroke experienced by a patient. Unfortunately, family members of stroke patients can have a poor understanding of how it works, what the numbers mean, and what the individual components entail. Generally, the scale is accurate and tends to predict damage/outcomes well. This is why we believe it’s important to give you an overview of the scale, how it works, what it means, and how to read it. What is the NIH Stroke Scale? The NIH Stroke Scale is a widely used tool that was built to assess the cognitive effects of a stroke. In more scientific terms, it “provides a quantitative measure of stroke-related neurologic deficit” (NIH Stroke Scale). How is the NIHSS used? The scale is made up of 11 different elements that evaluate specific ability. The score for each ability is a number between 0 and 4, 0 being normal functioning and 4 being completely impaired. The patient’s NIHSS score is calculated by adding the number for each element of the scale; 42 is the highest score possible. In the NIHSS, the higher the score, the more impaired a stroke patient is. How well does the NIHSS predict patient outcomes? Multiple studies have shown that the NIHSS predicts patient outcomes quite accurately, except in cases where the stroke was isolated to the cortex area of the brain, in which case the prediction is a little less accurate. As a general rule, a score over 16 predicts a strong probability of patient death, while a score of 6 or lower indicates a strong possibility for a good recovery. Each 1-point increase on the scale lowers the possibility of a positive outcome for the patient by 17 percent. Why is the NIHSS score important for patients? The NIHSS score is important for patients because it determines the course of action and treatment following a stroke. First, healthcare staff apply the NIHSS score as soon as possible after the onset of symptoms—which would typically be in the emergency department of a hospital. It will also be applied at regular intervals, and/or whenever the patient’s condition changes significantly. It’s important to keep a good history of a stroke patient’s NIHSS score because it allows healthcare professionals to monitor their progress, tailor their treatment, and quantify their improvement or decline over time. Now that we know a little more about the scale and how it’s used by healthcare staff, let’s have a closer look at the scale itself. As mentioned above, the scale contains 11 elements, related to a specific function, which are each evaluated with a score between 0 and 4; some elements only have a scale from 0 to 2. The higher the number, the more impaired that specific function is. The first element of the scale is level of consciousness, and it contains 3 sub elements (1a, 1b, and 1c). This element evaluates the level of alertness and responsiveness by asking a simple question (the current month and the patient’s age), as well as following a simple command (closing and opening the eyes and grasping and releasing a hand). This element of the scale evaluates possible damage to a patient’s ability to move their eyes normally. It is usually tested by asking the patient to follow an object horizontally. This element tests the patient’s visual field—their ability to see things that are not directly in front of them. The focus is on the upper and lower quadrants of the visual field. This element verifies the patient’s ability to move facial muscles. The test usually involves asking the patient to show their teeth or raise their eyebrows while closing their eyes. If the patient is not responsive, the test involves a noxious stimuli (like a bad smell) and observing the facial reaction. This element tests the patient’s ability to hold their arms up for a certain amount of time. The patient is asked to hold each arm, in turn, at a 90-degree angle if sitting or 45-degree angle if supine, palms down. A score of 0 (the best score) means that the patient can hold their arms up for at least 10 seconds without drift. This test is the same as with the motor arm, but with each leg held up at 30 degrees. A score of 0 means that the patient was able to hold the leg up for at least 5 seconds. The limb ataxia element involves the finger-nose-finger and heel-shin test on both sides. It tests whether there was damage in the cerebellum, which is the motor center of the brain. This item tests the sensory abilities of the patient using a pinprick and a noxious (unpleasant) stimuli. The level of response determines the score. 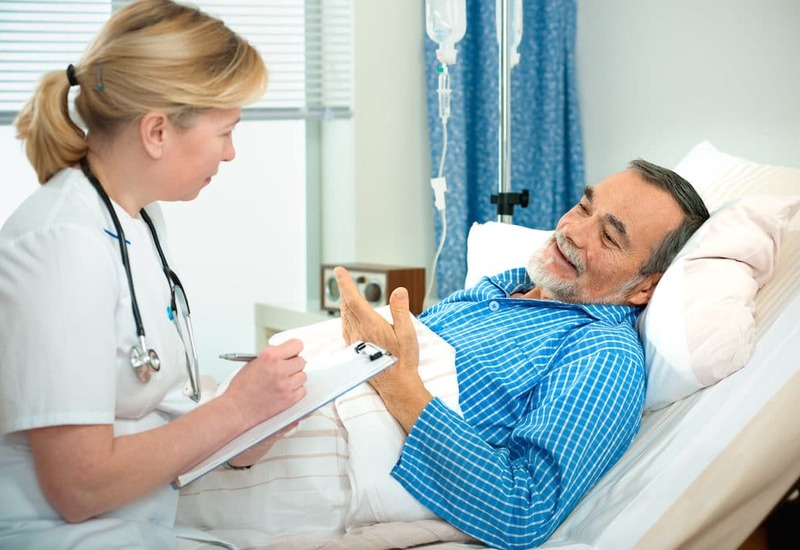 To see if the stroke affected the patient’s language abilities, they are asked to describe the situation in a picture. Loss of fluency, limitations on ideas that can be expressed, and other elements are used to evaluate the level of aphasia or speech/language impairment. This element tests the level of slurring in a patient’s speech. This can usually be inferred by all the previous tests. It is related to the level of attention a patient pays to their environment, and their general sensory abilities in each of the five senses. How does stroke location affect stroke severity? The NIHSS test focuses most of its items on the language abilities of the patient (7 of possible 42 points). So people whose stroke affects the left hemisphere (98 percent of people have their language abilities housed in the left hemisphere) tend to have higher scores than those whose stroke happened in the right hemisphere. This is why the NIHSS is better at predicting outcomes for patients with left hemisphere-centered strokes, rather than right-hemisphere ones. Because the NIHSS is such a widely used tool with stroke patients, it’s important that you know how it’s used and how to read it. We hope that this overview gives you a better idea of its importance for stroke patients, their caregivers, and their families.